JMJ Phillip is a Global Executive Search Firm specializing in the Manufacturing, Supply Chain and Technology sectors. Join JMJ Phillip and Toys for Tots as we support their annual toy drive. Donations of new unwrapped toys will be given to less fortunate children during the holidays. 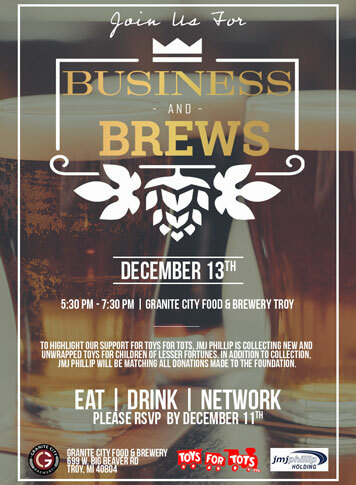 Enjoy a complimentary drink and light appetizers while meeting professionals from around the metro Detroit area. Expand your professional network to connect with prospective clients or employers. Drive your personal growth by meeting individuals from a wide variety of industries. Many of our open jobs are not listed so send us your resume below by clicking the Apply Now button. Call 877-500-7762, Email sales@jmjphillip.com or use the form below to contact us.